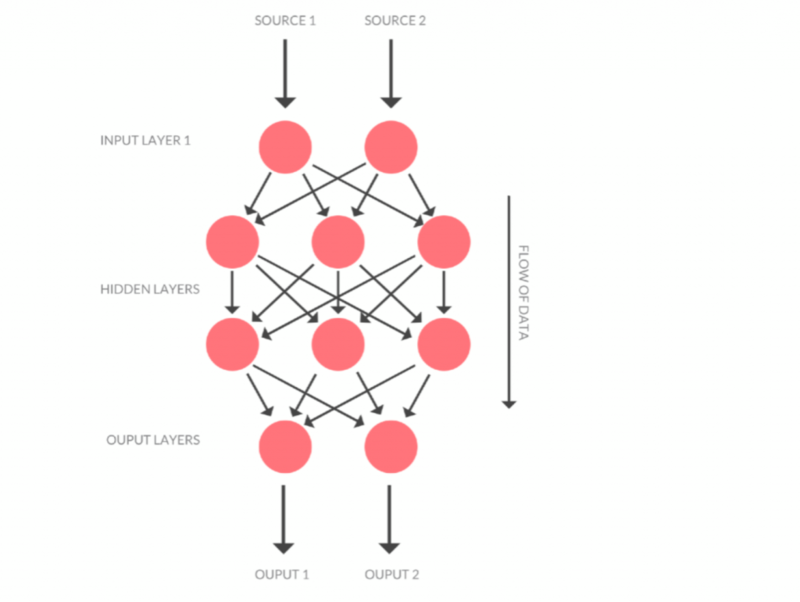 First, let’s do a quick recap of what a Neural Network is and how it is used. For this, we will start from the basic component of the neural network: The Neuron. This is a neuron. As you can see, a neuron has a set of inputs with its own weights plus a special input called a “Bias” which always has a value of 1. The goal of this structure is to establish that if all of the inputs of the neuron are 0, then the neuron will still have something after the activation function is applied. 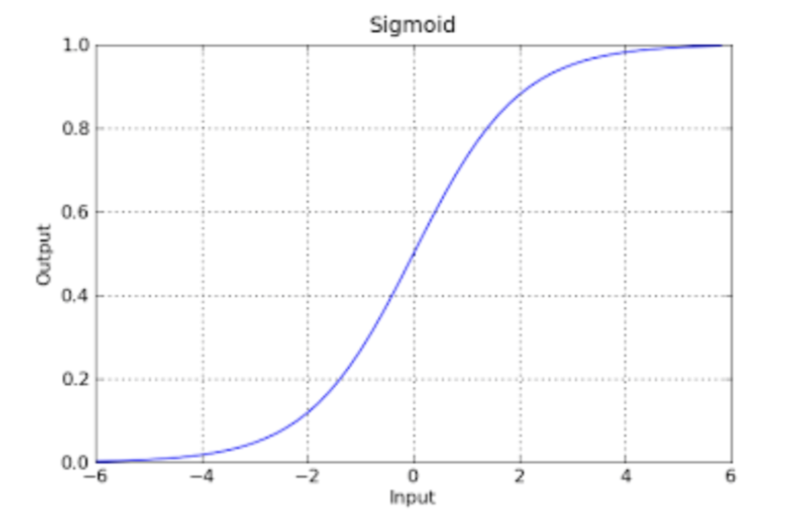 Here are additional resources to learn more about these activation functions: “Logistic Regression: Why Sigmoid Function?,” “Neural Networks 101,” and neural networking activation methods. In this example, we are using the Neuron class from synaptic to create two networks: A and B. Then we project A to B: the output of A is going to act as the input of B. 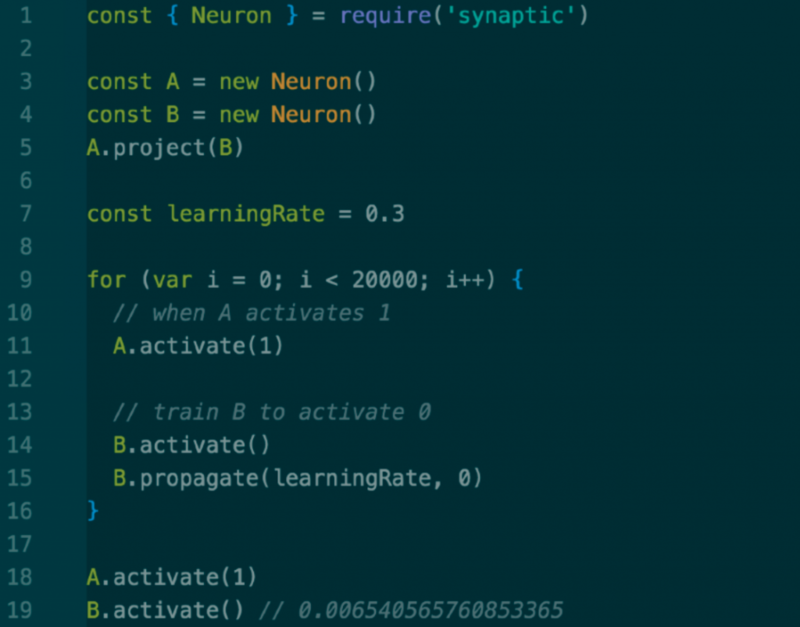 When we prompt A.activate(0.5), we are sending 0.5 as the output of the A neuron and it’s going to get multiplied by a weight (which will be random at first). It is then applied to an activation function on B to generate an output (0.3244554645) when B is activated. It is important to note, as in the example, that if we call to activate with a value, that means we want that value to be the output of the neuron. If we call to activate without any value, it is going to perform the activation function with the neuron state. 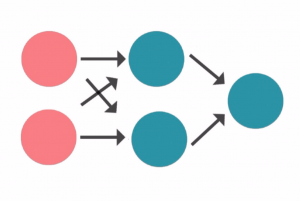 At this point, we have made a neural network composed of two neurons, but how does a network learn? There is another operation that a neuron can perform: Propagation. When we propagate, we “adjust” the random weights using the error, in order to get a desired output based on an input and its error. From this, we can determine how far off from our desired output we were based on the output that we got for that input. Here we have the code. Lines 1 through 5 are basically what we did in our previous example: We create the A neuron and the B neuron and project A to B. 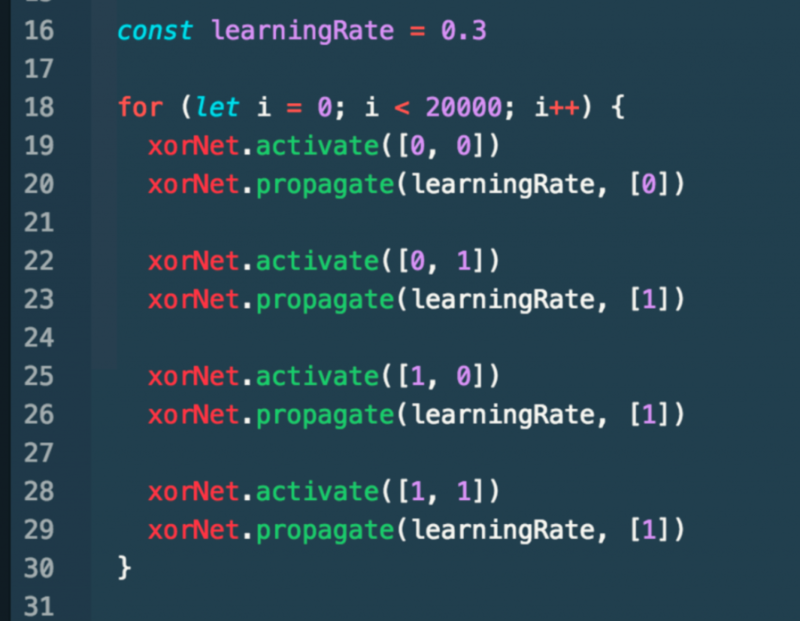 The next step is to loop the steps: A.activate, B.activate and B.propagate 20,000 times through a block of code that’s going to be our “training session:” To begin, activate A with 1, meaning that 1 x [randomWeight] is going to be the input of B. Then we activate B. Note that the first time this is done, you will likely get a higher number than 0 (perhaps even a 1), depending on the first randomWeight. This is okay and it is why we propagate after the activation. Using the learning rate and the desired output for the previous input, it calculates the error from the previous activation and the 0 that we want to achieve. 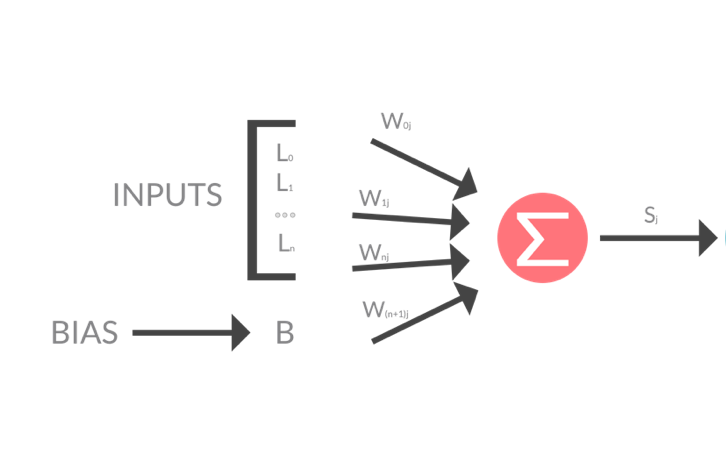 It then propagates that back to the connection between the neurons, adjusting the weights to get closer to the desired output: This is called backpropagation. This will be done 20,000 times; adjusting and re-adjusting the weight 20,000 times, so that whenever we have a network input of, we get a 0 output. After the “training session,” if we activate A with a 1, then activating B should result in a number very close to 0. And voila!, our network just learn how to respond 0 whenever it gets a 1! Of course, this is just a basic example, because a real neural network is composed of many neurons adjusted in various layers. 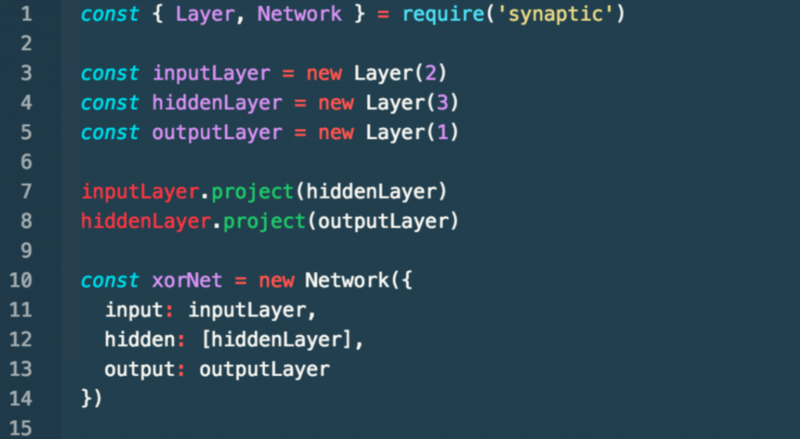 The first layer is called the Input Layer. This layer is comprised of the inputs provided by the engineer. The last layer is called the Output Layer, which will output the results of the activation of the network. 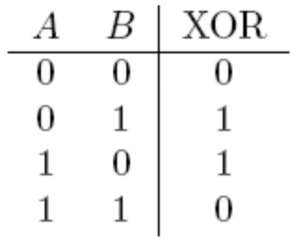 To perform this function, we need to train our network to understand the XOR output of each set of inputs. As seen here, networks have the same API as the neurons’ input value we activate it with, propagating the error using the desired output to adjust its weights. If you want to change the network results (for better or worse), you can adjust the learning rate and the number of loops per training session (hyper-parameters) to see what happens. You might also want to try Synaptic counts with other classes, such as an Architect (to build different types of networks), a Trainer (to create those training sessions easily), and more utilities that could save you time. For more on these, I suggest reviewing the Synaptic Wiki.